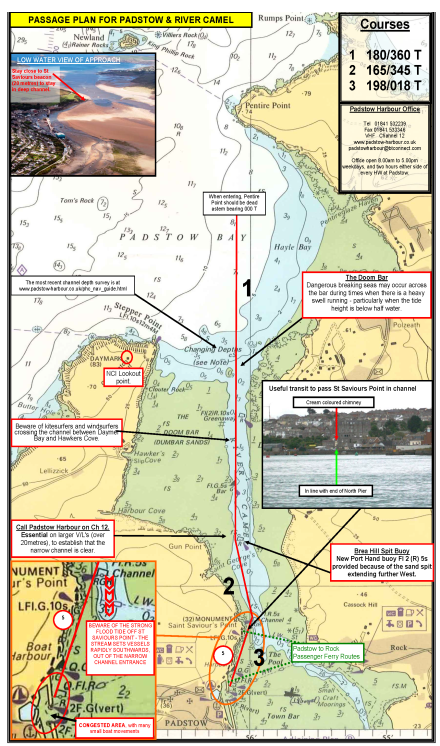 Padstow Navigation Guide download printable version. Local knowledge - Gavin Davies talks to former Padstow Harbour Master, Trevor Platt. By kind permission of Practical Boat Owner & Gavin Davies. Padstow lies some 50 miles to the NE of Lands End and is the only completely secure harbour on this stretch of coast until Avonmouth. Trevor Platt suggested that while the entrance has a bad reputation, it's largely undeserved provided sensible care is taken and you don't try to enter too early on the tide. Although there's a minimum of about 0.8m of water in the main channel, don't attempt entry if there's a big ground swell running. About three hours before local high water is the ideal time to start your approach. This also means you'll only have a short wait to get into the inner harbour. The approach to Padstow is dominated in the minds of many sailors by the fearsomely named Doom Bar, but as Trevor emphasises, in the right weather entry is neither difficult nor dangerous. Also, the word Doom is actually a derivation or Dun or Dunne meaning sand. At the wrong time and in the wrong weather the entrance can be treacherous though, even at HW. When strong westerlies blow into and across the mouth of the estuary they create an awkward swell and in such circumstances, especially near springs when the tides can run fast, it's better to make an offing and wait for more settled weather or head out round Newland and The Mouls. Tuck yourself well into the SW corner of Port Quin Bay where you'll find good holding and good shelter from the weather. But, when the weather's reasonable, or when Its blowing from just about anywhere except the west, the approach is perfectly straightforward. If you are arriving from the north and east stay north of The Mouls and the Newland Rainer Rocks. This line of approach will keep you well clear of the rocks of Rumps Point. From the south and west ft's safe to approach passing south of Gulland Island, but stand on for about half a mile beyond Stepper Point before turning south into the entrance channel - which actually begins just off the rocky Trebetherick Point. The first mark, a red can buoy (Greenaway), is about a cable south of the start of the channel itself. . Leaving this to port, the next mark is the green conical Bar Buoy, which marks the eastern edge of the drying sands and the southern extension of Doom Bar. If you look astern when entering the channel you should find Pentire Point bearing due north, while St Saviours Point bears due south ahead. Keep the Celtic Cross of the War Memorial on top of St Saviours Hill in line with the Bar Buoy to stay in the channel. UPDATE TO ORIGINAL TEXT: Due to the Brea Hill Sand Spit steadily building to the Westward, a new Port Hand Marker named Brea Hill Spit (Fl 2 R 5s) has been laid. Please see local Notices to Mariners #5 2017. 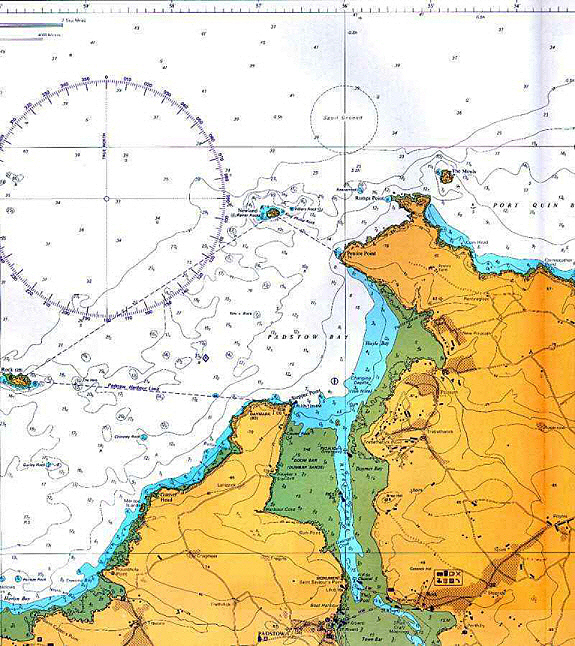 Once past the Bar Buoy, keep heading south for about half a mile and aim to cut close in to St Saviours Point, the extremity of which is matted by a beacon with a green conical topmark. To the NE of this lies the Red and Green Middle Ground Buoy which marks the point where the channel divides. The eastern arm leads to the moorings off Rock while the western arm takes you into the main harbour. This passage runs close inshore from St Saviours. Don't be tempted to give this point too much clearance; there's plenty of water close inshore from half tide up and no offlying dangers. If you stand off too far, and there's much of a flood running it will push you out of the channel on to the sands in the middle. One more port hand buoy and starboard buoy mark this quarter mile long channel which finally leads close in to the wall of the North Pier and thence through the wide entrance on your starboard side to the outer harbour. The inner harbour entrance will now be straight ahead. It has a tidal gate, which is open for about +/-2HW. Should you arrive too early you may have to anchor in the Pool just south of the Middle Ground Buoy but beware - the tide can run hard through here, or there may well be sufficient water to go alongside the outer wall of the north or south arms of the inner harbour while you wait. The Harbour Master will advise you. The other branch of the channel which passes to the east of the middle ground buoy is for small craft and will take you to the moorings off the sandy beaches of Rock. Unless you can take the ground there's really nowhere to anchor or moor in the river. It's possible to take the tide up to the picturesque little market town of Wadebridge but as Trevor Platt put it, navigation is very much by guess and by God since there are no channel markers although if you want to try it, " he says 'you should find the deepest water in the centre." Channel Depth Survey July 2018 - please click to download larger printable version. 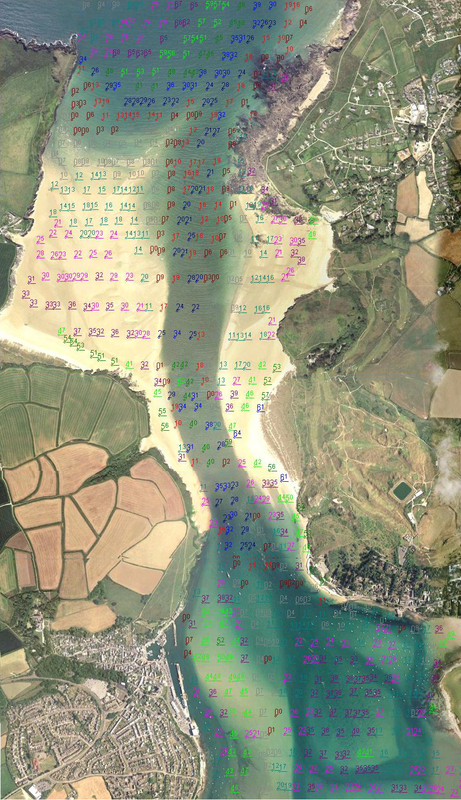 PLEASE NOTE: this survey has been produced for Padstow Harbour Commissioners' use. we are happy to share this on the understanding that it is NOT TO BE USED FOR NAVIGATIONAL PURPOSES. Please use this form to report details of specific navigational incidents or near misses which you have observed or been involved in. Urgent navigational dangers should be reported to the harbour office immediately – further information may be submitted at a later date.